Warwickshire (/ˈwɒrɪkʃər, -ʃɪər/ ( listen); postal abbreviation Warks.) is a landlocked county in the West Midlands region of England. The county town is Warwick, although the largest town is Nuneaton. The county is famous for being the birthplace of William Shakespeare. The majority of Warwickshire's population live in the north and centre of the county. The market towns of northern and eastern Warwickshire were industrialised in the 19th century, and include Atherstone, Bedworth, Nuneaton, and Rugby. Of these, Atherstone has retained most of its original character. Major industries included coal mining, textiles, engineering and cement production, but heavy industry is in decline, being replaced by distribution centres, light to medium industry and services. Of the northern and eastern towns, only Nuneaton and Rugby (as the birthplace of rugby football) are well known outside of Warwickshire. The prosperous towns of central and western Warwickshire including Royal Leamington Spa, Warwick, Stratford-upon-Avon, Kenilworth, Alcester, Southam and Wellesbourne harbour light to medium industries, services and tourism as major employment sectors. The south of the county is largely rural and sparsely populated, and includes a small area of the Cotswolds, at the border with northeast Gloucestershire. The plain between the outlying Cotswolds and the Edgehill escarpment is known as the Vale of Red Horse. The only town in the south of Warwickshire is Shipston-on-Stour. The highest point in the county, at 261 m (856 ft), is Ebrington Hill, again on the border with Gloucestershire, grid reference SP187426 at the county's southwest extremity. Much of western Warwickshire, including that area now forming part of Coventry, Solihull and Birmingham, was covered by the ancient Forest of Arden (most of which was cut down to provide fuel for industrialisation). Thus the names of a number of places in the central-western part of Warwickshire end with the phrase "-in-Arden", such as Henley-in-Arden, Hampton-in-Arden and Tanworth-in-Arden. The remaining area, not part of the forest, was called the Felden – from fielden. Some organisations, such as Warwickshire County Cricket Club, which is based in Edgbaston, in Birmingham, still observe the historic county boundaries. The flag of the historic county was registered in October 2016. It is a design of a bear and ragged staff on a red field, which is long associated with the county. Warwickshire contains a large expanse of green belt area, surrounding the West Midlands and Coventry conurbations, and was first drawn up from the 1950s. All the county's districts contain some portion of the belt. During the Middle Ages Warwickshire was dominated by Coventry, which was at the time one of the most important cities in England due to its importance in the textiles trade. Warwickshire played a key part in the English Civil War, with the Battle of Edgehill and other skirmishes taking place in the county. During the Industrial Revolution Warwickshire became one of Britain's foremost industrial counties, with the large industrial cities of Birmingham and Coventry within its boundaries. The video game developing company Codemasters is based in Warwickshire. Warwickshire is policed by the Warwickshire Police. The force is governed by the elected Warwickshire Police and Crime Commissioner. The county also has a county council based in Warwick which is elected every four years. The last election was held on 4 May 2017 and resulted in conservative control, a change from the 2009 result where the Conservative Party controlled the county. The county council operates a cabinet-style council. The county council is made of 62 councillors, who decide upon the budget and appoints the council leader. The council leader selects 2 to 9 councillors and together they form the cabinet. The Leader assigns portfolios on which cabinet members make decisions. Key decisions are made by the whole cabinet while others are made only by the portfolio holders for relevant areas. In the 2017 local elections the Conservative Party took control of the Warwickshire County Council. In the state sector, children start school in the school year in which they turn five. They stay at primary school for seven years (although this varies even within the county, as some people have previously gone for four years and then spent another four years at a 'middle school') until they are eleven. Warwickshire is one of the few local authorities in England to still maintain the grammar school system in two districts: Stratford-on-Avon and Rugby, although Southam claims to have a comprehensive school. In the final year of primary school, children are given the opportunity of sitting the 11-plus exam to compete for a place at one of the grammar schools, with two in Stratford and Rugby and one in Alcester; these are: Stratford-upon-Avon Grammar School for Girls; King Edward VI School, a boys' school; Lawrence Sheriff Grammar School for Boys, in Rugby, as well as, Rugby High School for Girls and Alcester Grammar School (mixed). The exam is sat on three different days and consists of two verbal reasoning and mathematics papers and one extended writing paper. To maintain standards, there is a bank of papers that are used in rotation. In 2006, it was revealed in a local newspaper, the Stratford Herald, that some private 11-plus tutors had copies of the exam papers and that they were using them as practice papers for their pupils. This meant that, in some cases, pupils sitting the exam had seen the paper in advance. Warwickshire contains four colleges of further education; North Warwickshire & Hinckley College which has main colleges based in Nuneaton and the Leicestershire town of Hinckley with smaller colleges based around North Warwickshire, King Edward VI Sixth Form College (K.E.G.S) in Nuneaton, Stratford-upon-Avon College and Warwickshire College, an institution made up of six main separate colleges that have merged (Leamington Centre, Rugby Centre, Moreton Morrell Centre, Pershore College, Henley-in-Arden Centre and the Trident Centre in Warwick). There are also five independent schools within the county, namely: Rugby School, Warwick School, Princethorpe College, Kingsley School in Leamington Spa, and the King's High School For Girls, Warwick. King Edward VI School, Stratford-upon-Avon still uses 13th century school buildings and is the likely school of William Shakespeare, Rugby School was founded in 1567 and Warwick School was founded c. 914 AD, which makes it the oldest surviving boys' school in the country. Rugby School is one of nine schools that were defined as the "great" English public schools by the Public Schools Act 1868, and is a member of the Rugby Group. Rugby School, Princethorpe College and Warwick School are HMC schools, with the Headmaster from each school attending the Headmasters' and Headmistresses' Conference. There are no universities per se in Warwickshire, though the University of Warwick forms part of the border with Warwickshire on the southern edge of the city of Coventry. Some areas of the University of Warwick are within the boundaries of Warwickshire including Lakeside Village and Warwick Business School The university has a small campus near Wellesbourne which houses the Warwick Horticultural Research Centre and an Innovation Centre. The M40 motorway, which connects London to Birmingham, runs through the centre of the county, and serves Leamington Spa, Warwick and Stratford. The M6 motorway, which connects northwestern England and the West Midlands to the M1 motorway (and then on to London), runs through the north of Warwickshire, and serves Rugby, Nuneaton and Bedworth on its way to Birmingham. The M69 Coventry to Leicester motorway, which serves Nuneaton. Other motorways pass briefly through Warwickshire including the M45 (a short spur south of Rugby connecting to the M1), the southern end of the M6 Toll, and the M42, which passes through the county at several points. The Chiltern Main Line, the former Great Western Railway route from London Paddington to Birmingham passes through the centre of Warwickshire on a route similar to the M40 motorway, and has stations at Leamington Spa, Warwick, (and Warwick Parkway), Hatton and Lapworth. Rail services are provided by Chiltern Railways and West Midlands Trains (Birmingham to Leamington only). There are also two branches off the Chiltern line, one from Leamington to Coventry, and another from Hatton near Warwick to Stratford. The West Coast Main Line (WCML) runs through Warwickshire. At Rugby the WCML splits into two parts, one runs west through to Coventry and Birmingham, and the other the Trent Valley Line runs north-west towards Stafford and the north-west of England. This section has stations at Nuneaton, Atherstone, and Polesworth (north bound services only). There is one branch off the WCML from Nuneaton to Coventry, and there are stations at Bermuda Park, Bedworth and Coventry Arena on this branch. Other railway lines in Warwickshire include the Birmingham-Nuneaton section of the Birmingham to Peterborough Line, which continues east of Nuneaton towards Leicester and Peterborough. Nuneaton has direct services to Birmingham and Leicester on this line, and there are two intermediate stations at Water Orton and Coleshill in the extreme north-west of the county. There is also a branch line from Birmingham to Stratford-upon-Avon. This line used to continue southwards to Cheltenham but is now a dead-end branch. There is an intermediate station on this line at Henley-in-Arden and at several small villages. Stratford also has direct rail services to London via the branch line to Warwick (mentioned earlier). Until 2018 the only major town in Warwickshire without a station was Kenilworth. The Leamington to Coventry line passes through the town, but the station was closed in the 1960s as part of the Beeching cuts. Following several delays, a replacement station opened in April 2018, with an hourly service to Coventry and to Leamington provided by West Midlands Trains. The Honeybourne Line is being reopened by the Gloucestershire and Warwickshire Railway connecting Cheltenham Racecourse to Broadway and Honeybourne on the Cotswold Line (which connects with Hereford, Worcester and Oxford, Reading and London Paddington). There is only a short gap to connect many places to Stratford upon Avon with Honeybourne by reopening the line into Warwickshire. There is a good business case to restore the Stratford-Cotswolds link line. Warwickshire has no Football League clubs. As of the 2018–19 season the highest-placed teams are Nuneaton Borough and Leamington, who both play in the National League North, the sixth tier of English football. A level below in the Southern Football League Premier Division are Stratford Town. Other clubs include Rugby Town, Bedworth United, Southam United and Racing Club Warwick. All of these are affiliated to the Birmingham F.A. Aston Villa, Birmingham City and Coventry City are Football League clubs located within the historic boundaries of Warwickshire, along with National League club Solihull Moors and Southern League Division One Central club Sutton Coldfield Town. Warwickshire County Cricket Club play at Edgbaston Cricket Ground, Birmingham (historically part of Warwickshire). Notable English players for the side have been Eric Hollies, M.J.K. Smith, Bob Willis, Dennis Amiss, Jonathan Trott, Ian Bell, Moeen Ali and Chris Woakes. Overseas players have included Alvin Kallicharran, Rohan Kanhai, Brian Lara, Allan Donald and Shaun Pollock. In 2014 the club partly severed its links to the county by renaming its Twenty20 side the Birmingham Bears, much to the chagrin of many supporters. The Warwickshire County Board of the Gaelic Athletic Association (GAA) (or Warwickshire GAA) is one of the county boards outside Ireland and is responsible for Gaelic games in Warwickshire. The county board is also responsible for the Warwickshire inter-county teams. They play their home games at Páirc na hÉireann. The Dallas Burston Polo Club is a six-pitch polo club located near Southam. In March 2014 the freedom of the county was bestowed on the Royal Regiment of Fusiliers. The honour was officially bestowed following a parade through Warwick on 6 June 2014. 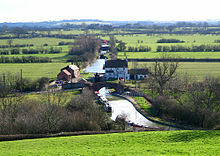 Warwickshire is perhaps best known for being the birthplace of William Shakespeare from Stratford-upon-Avon. Even today, road signs at the county boundary describe Warwickshire as "Shakespeare's County". The county has also produced other famous figures such as Aleister Crowley (from Royal Leamington Spa), George Eliot (from Nuneaton), Rupert Brooke (from Rugby), and Michael Drayton (from Hartshill). The poet Philip Larkin lived in Warwick (born in nearby Coventry), and Elizabeth Gaskell went to school in Barford and Stratford. Folk musician Nick Drake, who record for Island records in the late 1960s and early 1970s, lived and died in Tanworth-in-Arden. ^ "2011 Census: Key Statistics for local authorities in England and Wales" (XLS). Ons.gov.uk. Archived from the original on 24 February 2016. Retrieved 19 July 2017. ^ Planet, Lonely (10 May 2016). "Warwickshire: the heart of English history – Lonely Planet". Lonely Planet. Archived from the original on 21 August 2017. Retrieved 18 May 2017. ^ "UK Flag Registry- Warwickshire". Flag Institute. 2016. Archived from the original on 7 November 2017. Retrieved 27 September 2016. ^ "British County Flags - Warwickshire". British County Flags. 2016. Archived from the original on 14 October 2016. Retrieved 27 September 2016. ^ "How the County Council makes decisions". Warwickshire County Council. Archived from the original on 11 April 2010. Retrieved 5 May 2010. ^ "Coventry News: The latest Coventry news updates from". The Coventry Telegraph. Archived from the original on 15 April 2011. Retrieved 19 July 2017. ^ "Teachers in Warwickshire threaten strike action in protest over academy plans". icCoventry.co.uk. 15 April 2011. Archived from the original on 20 April 2013. ^ Railnews (22 October 2012). "Good business case for Stratford-Cotswolds link". Railnews. Archived from the original on 2 June 2014. Retrieved 2 June 2014. ^ Brian Halford (25 February 2014). "Warwickshire's T20 'Birmingham Bears' name is confirmed". Birmingham Mail. Archived from the original on 9 January 2018. Retrieved 19 July 2017. ^ "Royal Fusiliers honoured with Freedom of Warwickshire". BBC News. BBC. 28 March 2014. Archived from the original on 28 March 2014. Retrieved 29 March 2014.